We loved all things Disney when I was little. If a Disney movie was released - or re-released - we went to the theater. When we had cable, we paid for the then subscription-only Disney Channel. And when we no longer had cable, Michael Eisner and the Disney company were kind enough to air The Disney Sunday Movie on ABC. 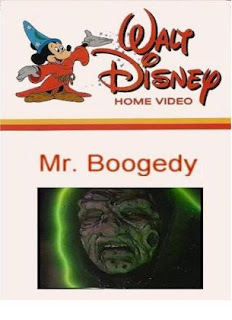 My dad taped many an episode of that series, whatever channel or name change it went through, but our favorite - my dad's, my sister's, and my own - was Mr. Boogedy. I would buy this on DVD. This was a fun original movie. It starred Richard Masur and Mimi Kennedy as gag shop-owning parents who move their three children to a creepy old house in a creepily named New England town called Lucifer Falls. The kids are played by Kristy Swanson (the original Buffy! ), David Faustino (Bud Bundy! ), and Benji Gregory (the kid from ALF!). Their first night in the house, they're greeted by a weird man, Neil Witherspoon (John Astin! ), who warns them to beware of "Mr. Boogedy." The parents brush old Neil off, but before too long, the kids start to see crazy things happening around the house. They visit the historical society, where they find - who else? - Neil Witherspoon, who tells them the tragic story behind the haunting. Of course, there is an eventual showdown with Mr. Boogedy himself. We loved this little movie. We thought it was hilarious, the parents especially - Mimi Kennedy's laugh! A year later, there was a longer sequel entitled Bride of Boogedy. We never liked it as much. The parents and David Faustino remained, but Benji Gregory and Kristy Swanson had been replaced by the little boy from Harry and the Hendersons and Tammy Lauren. (Tammy Lauren and Mimi Kennedy would go on to co-star on Homefront, one of my favorite series from the '90s. And yep, I found that whole series on YouTube, too.) And John Astin is gone, although Eugene Levy is on board as another villain. The girls watched the first movie with me last week. They enjoyed it! I think it's more silly than scary, although I admit, my kids are a bit hard to scare (The Dark Crystal aside). I miss those Disney movies! I read once that a lot of people just hate all things Disney. Isn't that sad? I think it's a I'm too cool for Disney thing. I am NOT too cool for Disney!! I've never seen any of the Real Housewives series, but I always think of crazy Bette Davis when I think Watcher in the Woods. I've never read the book, but the movie was on one Saturday morning when I was younger, and I felt compelled to watch it! I'm weird about Disney. I love classic Disney and I love Pixar, but I detest the pink Disney Princess hype and packaging, and I really cannot stand the inferior direct-to-video sequels. I went from wanting to work at the Disney Store in college to scowling at the Disney section on the kids' porch at Barnes & Noble. Sigh. I don't spend too much energy whining and griping about Disney, but I don't love it like I did as a kid. Little Sis and I watched another made-for-TV Disney movie today on YouTube, Child of Glass. I forgot how much I LOVE that one. It's a ghost story, but not a scary one. As the kiddo said, "The ghost is pretty." I looked it up and discovered that was written by Richard Peck -- I love some of his other books!! And there are sequels to it, I think! Happy International Ivy + Bean Day!